August 2018: There is an FPA Traders Court guilty vote against this company. The FPA recommends extreme caution dealing with BinaryOnline until this issue is resolved. 2018-01-26: The Estonian Finantsinspeksioon has issued an alert against Binary Online. CLICK HERE to verify. 2017-07-14: The Monetary Authority of Singapore has issued an investor alert against BinaryOnline.com. CLICK HERE to verify. 2016-12-14: The Canadian BCSC has issued a warning against BinaryOnline. CLICK HERE to verify. Related sites include Trader.Online. The other websites of this company BinaryOnline.com. 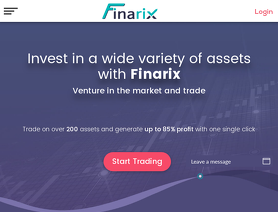 Previously BinaryOnline, rebranded to Finarix in Feb 2019. 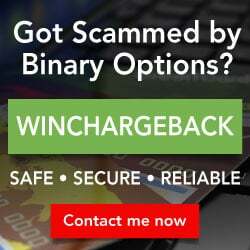 I had a comically bad experience with BinaryOnline before, and following the call from the Finarix representative this morning it looks like it's the same people still working their scam. I've dealt with them for over 14 months, and felt I need to leave this review as the new company probably think they'll get away with a clean sheet and no bad review baggage. May this help innocent folks look elsewhere with their hard earned money. - Once your money is in, it's near impossible to get it back. From my $30,000 deposit I made an initial small withdrawal to test things out, which worked fine once "approved" by their finance department, but subsequent attempts had the most incredible excuses and rejections. You can try get your money back through VISA or Mastercard if you paid by card. - Whatever you do, do NOT accept a "risk free trade" or a "bonus trade". This is where they hook you and your money then becomes their money before you can say "unethical scammers". - They are based out of Bulgaria are not regulated by anyone like the FCS. They operate by their own laws. This morning I had a call from someone there who told me that "there's not enough activity on your account, we have to close it because of money laundering regulations." I said I completed a winning trade for $200 6 days ago, does that not count? The person replied "No there's still not enough activity on your account". The conversation ended with him telling me "Good luck losing your money". You can't make this stuff up. I've resigned that I'll never get my money back, and just trade there for practise as you would with a demo account. - You will have the most incredible conversations with people trying to pressure you into whatever their latest "product" is, usually algo trading, and they will use pressure tactics and eventually aggression to try convince you to invest more money. They will pass you from one account manager to another over time, and they will all one way or another pressure you to invest more money. - The two biggest con artists in their team are Viktor Bokrov and Peter Thompson. Both I believe are using fake names (some of the BinaryOnline reviews calls this out as well) - I thought I'd leave the names here should someone google them that they at least get a heads-up not to trust them. Another thing I noticed is that they will never put anything in writing, it will only ever be a telephone conversation. Hopefully this will be helpful to someone. The last review I left for BinaryOnline here magically went away after a couple of days, I've copied the text this time and will put it on other sites as well should this one vanish. This is the new name/brand for binaryonline.com, a scammer broker that kept € 6800,00 from my account to themselves, and scammed many other users. I suggest people to not work with them as you will probably lost your money. Please check the reviews for this scammer here in FPA to get more information. In december 2017 I registered at binaryonline.com. I invested 250 €. I have made some profits with trading and now have 373,63 € in my account. I wanted to withdraw some money and that's where all the problems started. Due to their terms and conditions, it is mandatory for their adviser to give you a phone call before any withdrawal. So I got that phone call and they wanted me to deposit 2000 €, so I can withdraw 500 €. It was said, that I have to do something for their firm, so they can do something for me in return. I didn't want to invest any more money and got very suspicious. Every time they called me, I wanted to talk only about 2 things - withdrawal and deleting my account. The adviser was very offensive and aggressive, I have been threaten, that the adviser has the power not to grand my withdrawal if he/she decides so. They are making new terms all the time and it is impossible to withdraw the money. Let me tell you, that I thought, that I have lost all my funds and that i wrote them to close my account. I then tried to log in and I couldn't, so I thought the story was over for me. Last week they called me and said I still have funds in my account - don't ask me how. And because i haven't been trading, my account was dormant. I had to place 5 trades, which I did. Advisors kept calling me and telling, I have to deposit 2000 € so I can withdraw 500 € - it's been said I have to do something for their firm, so they can do something for me in return. I didn't deposit any more money and I surely wont. I think I don't have to mention, that the advisors were offensive, aggressive and they threatened me. After I read a lot of post here, I filled complaints here: https://www.econsumer.gov/en/FileAComplaint#crnt , here: http://ec.europa.eu/solvit/index_en.htm , and here: https://www.fca.org.uk/ . I have been recording the phone calls too. I have informed them about all the actions I have been taking. The next day I got an email, that my withdrawal request has been approved. That was on a friday, and on monday the funds were in my account. So, I can happily say, that my "binary online story" is finished. I hope, this can help someone, who has issues with binary online. Aug 3, 2018 - 1 Star Well ... In december 2017 I registered at binaryonline.com. I invested 250 €. I have made some profits with traiding and now have 373,63 € in my account. I wanted to withdraw some money and that's where all the problems started. Due to ther terms and conditions, it is mandatory for their adviser to give you a phone call before any withdrawal. So I got that phone call and they wanted me to deposit 2000 €, so I can withdraw 500 €. It was said, that I have to do something for their firm, so they can do somenthing for me in return. I didn't want to invest any more money and got very suspicious. Every time they called me, I wanted to talk only about 2 things - withdrawal and deleting my account. The adviser was very offensive and aggressive, I have been threaten, that the adviser has the power not to grand my withdrawal if he/she decides so. They are making new terms all the time and it is impossible to withdraw the money. Let me tell you, that I thought, that I have lost all my funds and that i wrote them to close my account. I then tried to logg in and I couldn't, so I thought the story was over for me. Last week they called me and said I still have funds in my account - don't ask me how. And because i haven't been traiding, my account was dormant. I had to place 5 trades, which I did. Advisors kept calling me and telling, I have to deposit 2000 € so I can withdraw 500 € - it's been said I have to do something for their firm, so they can do something for me in return. I didn't deposit any more money and I surely wont. I think I don't have to mention, that the advisors were offensive, aggressiv and they thretened me. Thank you for following up with very helpful advice. These guys are a bunch of Scammers who need to be exposed. Been with them for over a year and consistently trading that account. They always make excuses to release withdrawals. Its always the same people using different aliases . I have been building up a case against them. I would recommend everyone to stay away as you will never see your money again. Jul 23, 2018 - 1 Star I have also invested funds with them,been with them for almost a year. tried requesting withdrawal over 15 times and every single time they come up with a different story. They keep moving me from one portfolio manager to another. This company needs to go down!! We all need to do this together. Drop your emails and lets all work together in bringing them down, there are many cases against them already. We just need to make them stronger. My name is Vasco and i am profissional trader. I have my website, i am mentor and teach people how to trade. Regards this broker doesn't have regulation i deposit the minimum. And i have no problems to increase, i am a very aggressive trader and i pass from 250€ to 20k€ in less than 2 months. 1- my account was under investigation because i'm a suspicious and fraudlent guy. 3- i have to place 15 trades a day during a while to prove i didn't understand what! Or to deposit more. I thought to loose something intentionally, about 10k and they will think "ok, we'll give this one to him and block him" . . . mistake of mine. 4- the block and delete my account. 5- after 1 or 2 months i receive an e-mail saying to reset my password (probably them mistake) and i have access to my account. Was good to take some prints and poofs i will expose them in a post. 6- they say my account was dormant because i hadn't trade. "off course . . . . you blocked me, REMEMBER"??? 7- i've tried to contact them and hadn't no more answers and i'm deleted again. 8- i forgot to say, this SCAMMERS ASKED ME TO TEACH MY STRATEGIES SAYING IM BETTER THAN THEM ANALYSTS. What a shame!!!!!! I started my account in December 2017, my supposedly account manager Victor Bagrov ( who doesn't respond to my emails anymore ), was contacting me many times a day to increase my investment from USD500 to USD20'000 to have a better profit margin. I refused, the after few weeks, he contacted me to join a program called Algo, the investment will be automated and high profit margins will be expected, but in order to enroll, I will need to deposit a further USD4500 in order to have a total of USD5000 in my account, I was sent a contract, that looked so unprofessional, after correcting it, I signed, and had to chase up my copy for weeks. I thought its too late to back off, so lets see where we will end up, the software of course shows you tons of profits, the software made 45% of profits in about 3 months, when it was over, Victor called me to say that in order to continue, I will need to have 250K in my account, I was even going to fall for that, then I thought, let me try and withdraw some money out, and that’s when everything got exposed, first they said I had to wait 30 days because of the contract, while that paragraph referred to the cancelation of the software, you can't cancel it when its finished already, I waited 30 days, and approached them again 1 month later, for them to tell me that my account is in a dormant state, and I will need to do 5 trades in order to take it out of this state and my money will be transferred. I did follow there rules, and after the trades, I made more money, and now I have 12'559.61 in my account, yet nothing is being transferred, I contacted them many times through there chat support, ( this and email are the only ways of contact available!) and they tried to stall me further by saying that my case was escalated to the investigation team, then to top management, later a guy called Peter called who promised to sort things out, he did not! I start to get emails from all sorts of departments, who apparently are not talking to each other, and I keep on getting a different reply from different individuals. I have sent the final email stating that unless all of my funds are transferred, I will follow up this matter legally, I have all the documents, emails, live chats, and screen shots available for more details. Last November 2017 I gave them my savings £20,000 as they said it would double in no time. I explained to my account manager Andy Klein that I needed this amount in March end of April 2018 at the latest, to go towards a house. He set up two accounts for me, one to be a normal trading account which I he wanted the funds to be in small amounts of £5,000 and the other account he set up for me was their 10% cashback programme and had to be a minimum of £5,000 investment, which he said would run on its own and give me a wage every month. Several weeks during Feb through to March I didn't hear from him even though I emailed and sent several skype messages to call me. The number I had for them would not connect. I needed some funds for an emergency in February so requested a withdrawal of £5,000 on the platform and in email. Andy phoned me the next day to say he had approved £2,000 but the rest was needed to leverage my account. I didn't understand really but I said I trusted him to do right by me, knowing my circumstances and accepted the £2,000 back. Later I began to panic as the time was close approaching my having to fund my house and I couldn't always get hold of him, so I decided then to withdraw my money. They won't give it to me unless my account turns a certain amount of trades I think 90 was the figure thrown but by then I was so emotionally upset I didn't take in all the information. Andy phoned me shortly after and assured me all would be well and to trust him, so he'd phone once a week and arrange for trades to placed. He didn't always phone when he said he would and I grew increasingly worried I wasn't going to make the date of meeting my estate agent. Later still and a few weeks before I was to meet the agent for my house I emailed support requesting my money back, as was agreed with Andy and thanked him for his help but I needed it then, for my house. I then received a call from a Peter Thompson, who he said was a senior manager and would be taking care of my account from then on. and mentioned about the account having to qualify first by a few trades and for me not to worry that I would be ok for my house end of April, so I reluctantly agreed. Well, having lost my first house but since agreed with the agent on another rented one instead, I agreed to pay a years rent in advance end of April 2018 if they reduces it slightly and they did. I paid a deposit £2,500 to secure it. March came and went and the first week of April I had to tell the agent yet again I couldn't pay for the year upfront as an investment hadn't come through but was due end of April. The owners were waiting on the full amount and were annoyed I broke their first agreement so they asked for two months rent. I had to borrow it from friends but I moved in April 28th 2018 with the proviso I would pay the balance end of June. I'm still trying to get my money back from Binaryonline and still dealing with Peter and although he doesn't call me when he says he will, I remain optimistic because I don't know how else to feel, apart from numb, shocked and stupid to have been taken in. I made a $500 dep and they gave me a $500 bonus, after the broker told me to put $500 on gold I lost it,then I made some profit and try to withdraw some of it with no luck, they told me to make thirty times the amount of the bonus , so after a couple of tradings I made $32OOO !!!! Trying to withdraw they came with some lame excuse telling me there was a problem with the market and platform so they just took $32000 out of my account and left with $1700 and told me to start trading with that again. How can they just take your profit and made some excuse up. THEY ARE SCAMMERS. Stay Away from Binaryonline, its impossible to withdraw your money.